This is a very special quilt for me. I made it as a way to showcase some of my favorite prints - fabrics I had used so many times, I literally only had a few inches left to work with. I surrounded a few fun squares with a quieter fabric, and used longer cuts of my favorite prints to double-border some solids from my charm square stash. Each block finished at about 8.5", and the white border is two inches wide. I backed the quilt with a periwinkle polka-dot flannel left over from another project - all in all, a very economical quilt! I hand-quilted the entire quilt, starting with an allover grid pattern on the three blocks that run diagonally from the bottom left to the top right. 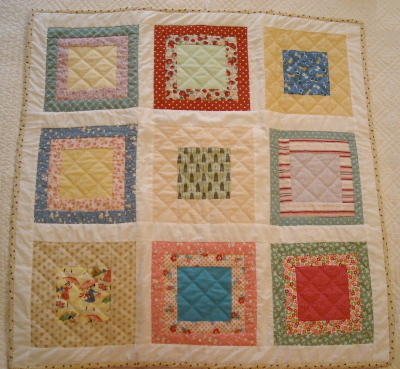 I repeated the grid on all of the solid or tone-on-tone squares, then stitched in the ditch of the accompanying borders. I left the white borders un-quilted for some extra puffiness. The dark specks on the binding are actually tiny brown chicks among a sea of yellow dots. They're one of my favorite things about this quilt! The binding, and all of the supplies I used, came directly from my stash. I never thought I'd say this, but I loved quilting on a budget! I like this one, it has pretty and comforting color and pattern. The simplicity of it really shows of the wonderful prints.